The best addition to your family’s jewelry traditions. Since 1959 Will Jewelers of Fort Wayne, IN has made the commitment to excellence in fine jewelry a family tradition. It all began with Donald and Doris Will and continues today with all ten of the Will children working for the family business. Over the years they have enjoyed expanding their family through generations of loyal customers. It is this special commitment to a family jewelry tradition that Coast Diamond honors Will Jewelers as our featured retailer of the week. Will Jewelers offers appraisals, cleaning, and potential repairs for your fine jewelry and watches that will keep your memories sparkling, from generation to generation. Your family traditions start the day she says “YES!” Together, Will Jewelers and Coast Diamond will help you create the perfect engagement ring or wedding set to begin your family jewelry traditions. When you come into Will’s, they will help you pick the perfect Coast engagement ring setting and center stone. With your love and Will’s care, you will create an heirloom that will be cherished for generations in your family. Propose with a timeless heirloom, Coast Diamond’s 1CT oval halo engagement ring (LC10233) with delicate diamonds down the shoulders of the ring. Pop the question with this classic Coast Diamond 1CT engagement ring (LC10291) which features a finely braided diamond shank. Continue the family tradition with a visit to Will Jewelers to choose a Coast Diamond anniversary band that represents the years of love and joy you have shared. On your anniversary get her to say yes again with this Coast Diamond 3 row, 1.43CT diamond band (WZ5105H). Congratulations Will Jewelers for your commitment to creating lasting family jewelry traditions and being our Coast Diamond Featured Retailer of the Week! There is something unique that sets Classic Rock Custom and Designer Jewelry of San Jose, Ca apart from other jewelry stores: the free classes they offer to their customers. It is their desire for you to learn more about diamonds, so your diamond buying experience at Classic Rock leaves you completely satisfied and makes you happy. Giving this little extra to their customers is why we chose Classic Rock of San Jose as our Coast Diamond Featured Retailer of the Week. Classic Rock Owner, Jeanne Katsuro has 35 years experience as a diamond expert, gemologist and jeweler. Sharing her expertise with you is important to her, so you feel confident about your entire purchase with Classic Rock. Did you know? Choosing a center stone for your Coast Diamond engagement ring is the best way to personalize your engagement ring. After taking a class with Jeanne, at Classic Rock, we know you will be ready, and excited, to customize your Coast ring. These Coast Diamond rings (and many more) are waiting at Classic Rock to be customized by you. Which one do you choose for your fall proposal? Cradle the perfect diamond center stone in this traditional Coast Diamond 6 prong engagement ring (LC5250) with round diamonds cascading down the shoulders of the ring and matching wedding band (WC5250). Accent your 1 CT diamond center stone with this award-winning Coast Diamond engagement ring design (LC5410) featuring a cushion shaped halo and matching wedding band (WC5410). You don’t want to miss our Coast Diamond wedding bands when you visit Classic Rock. They are the hottest bridal trend for 2016! Complete your wedding set with the trendsetting Coast Diamond twisting wedding band (WC10180H) of fishtail set diamonds. Congratulations Classic Rock Custom and Designer Jewelry of San Jose, Ca for being our Coast Diamond Featured Retailer of the Week! Four generations and the dream continues. Albriton’s Jewelry Inc. of Jackson, Mississippi started with the dream of John Leslie Albriton Sr. to bring the highest quality fine jewelry with impeccable customer service to the greater Jackson, MS area. Navigating the Great Depression and pursuing expansion of Albriton’s over the past 95 years, the fourth generation of the Albriton family continues that same dream today. Four Generations of making dreams come true: (From right to left) John Albriton, Sr., Cameron Albriton, John Albriton, III, and John Albriton, Jr. There is no better place than Albriton’s Jewelry Inc. to make your dreams come true when finding the perfect Coast Diamond engagement ring. As a Coast authorized retailer, Albriton’s will guide you in creating the ideal Coast Diamond engagement ring that represents your love and life together. The diamond center stone is the most important choice you will make in personalizing your engagement ring. At Albriton’s you will learn about the Four C’s of Diamonds so you can choose the most stunning center stone for your Coast Diamond ring. A popular engagement ring trend is a unique shaped center stone, and ovals and pears are IT! Delicate Diamonds surround this Coast Diamond 1 CT oval halo engagement ring (LC10233). Another popular trend in wedding sets is ornate bands because of the sparkle they add to a bride’s finger. Intertwining Diamonds create a stunning halo on this Coast Diamond 1.5 CT engagement ring (LC5449) and matching wedding band (WC5449). Sumptuous Diamonds mesmerize in this Coast Diamond 2 CT halo engagement ring (LS10147) with 3 rows of tapered diamonds down the band. Congratulations Albriton’s Jewelry Inc. of Jackson, MS on your 95 years of impeccable customer service and being our Coast Diamond Featured Retailer of the Week! Green Brothers Jewelers proudly serves Texas in the fine jewelry business and has built their legacy on superior quality jewelry and jewelry services. Brothers, Felton and Shelby Green founded Green Bros. in Bay City, TX in 1946 and the legacy continues today with Felton’s sons, Allen and Gary. Green Bros. Jewelers success over the past 70 years is due to their passion for cutting edge style and design. Coast Diamond is thrilled that Green Bros Jewelers is an authorized retailer committed to bringing their customers the top trending styles in engagement ring and bridal design. Their is nothing hotter in fine jewelry today than stackable bands. Stack them. Mix them. Customize them. Coast Diamond’s bands, available at Green Bros. Jewelers, offer you endless options. Petite and Precious Coast Diamond stackable pave set diamond bands (WC5191H) available in rose, yellow or white gold and platinum. You need nothing more than this dazzling Coast Diamond band… But if you want to customize your stack of bands, make this the center of your creation. DAZZLING Coast Diamond band (WZ5002H) with two rows of brilliant diamonds totaling 1.45 CT.
For the classic, yet trendsetting bride, this Coast Diamond wedding set, with a split shank engagement ring and matching diamond band are a perfect stack! Green Bros. Jewelers offers their lasting commitment to honesty, integrity, and a very high standard of ethics at two store locations, the original in Bay City and the store in Victoria, which opened in 1983. Congratulations Green Bros. Jewelers of Texas for 70 years of honesty and integrity in the fine jewelry business. 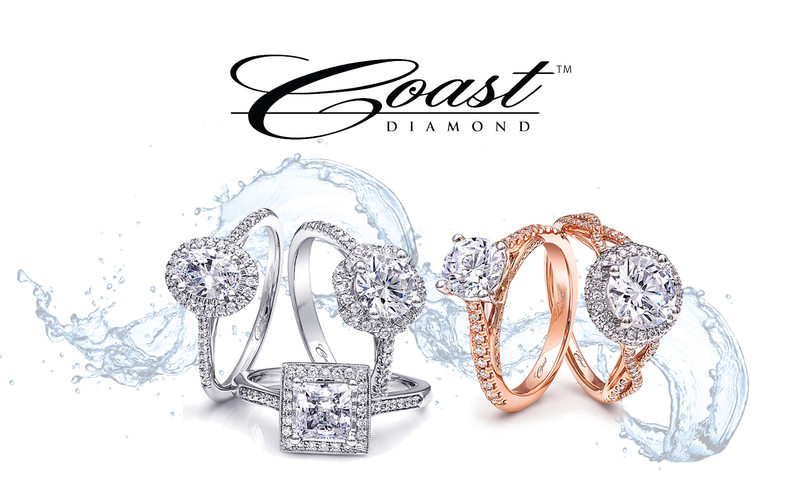 We are thrilled to call you this week’s Coast Diamond Featured Retailer! For almost 20 years Quest Fine Jewelry has been making a strong impression in the fine jewelry business with their exceptional customer service and passion for design. This passion is reflected in the numerous Five Star reviews they receive from their customers on The Knot, WeddingWire and Yelp. Their outstanding ability to take a Coast Diamond engagement ring and help a customer personalize it to perfection is a reflection of their “expertise, integrity, and a desire for perfection”. Coast Diamond is thrilled to have Quest Fine Jewelry our Retailer of the Week. How would you personalize these top-selling Coast Diamond engagement rings from Quest Fine Jewelry? Delicate and Traditional Coast Diamond 2 CT engagement ring (LC10020) with intricately set diamonds on the shank and matching wedding band (WC10020). Tailored Trendsetter Coast Diamond 1 CT halo engagement ring (LC10213) . Our Coast Diamond fishtail set diamond wedding band is the best selling Coast ring at Quest. It reflects the bridal jewelry trend of the moment, unique and stackable wedding bands. Is this the perfect band to complete your wedding set? The Best Seller Coast Diamond band (WC5180H) with fishtail set brilliant round diamonds across the top half of the band. How about one or two or three of these? Our Coast Diamond bands are available in platinum and rose, white or yellow gold. Colored gemstones and unique shapes allow you to choose the perfect set of bands to create a personalized wedding set. Quest Fine Jewelry is located near Tyson’s Corner, VA. If you are taking the Metro, use the orange line and give Quest a call ((877) 860-0826) and they will arrange transportation for you from the Dunn Loring station. Congratulations Quest Fine Jewelry for consistently offering exceptional customer service and being our Coast Diamond Featured Retailer of the Week!